Welcome to American 1 Easy Pay - The best way to make your loan payments! First time users will need to sign up for Easy Pay. This is separate from American 1 Home Banking. Click one of the Sign Up links to get started. Your account number will be your base account number. You will not include any loan numbers or share IDs. For example: 123456 rather than 18000012345605. 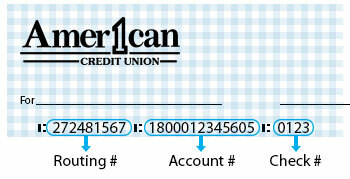 Your account access code is the primary member's birthday followed by their zip code. Next you will need to create a User ID and Password, and select a Hint Question. Several of the required fields will be filled in on your behalf in the Contact Information section, however, you must fill in your email address. After all required fields are completed, slide/click the “Yes / No" button to agree to Easy Pay terms and conditions. Then click submit. A confirmation page will come up. You will then be directed back to the original log-in page. Enter the User ID and Password that you have created. CLICK HERE to get started with Easy Pay.